There have been perhaps 2 dozen full or partial small earth reconstructions over time. Some were not complete. Over half had the Ocean Age Data available to them. All are similar in the Atlantic reconstruction. They differ significantly in the Pacific and Indian Ocean regions, indicating reconstruction problems. Sam Carey never completed a full reconstruction but made many excellent partials. This likely indicating he felt that some significant evidence was still missing. How the earth “Jig-Saw” pieces fit together is not obvious and confounds all authors. They have all necessarily madesignificant and often unstated assumptions which need be unraveled for a different thought process to develop. A considerable (yet focusing) problem is where to put the huge coastal circumference of Antarctica and where to fit the sharp oblique angles of Australia. These angles alone seemingly indicate Australia would fit nicely into 4 totally different areas! How can this be? An assumption that appears common to many is that since the oblique angles of one continent match the oblique angles of another (on a different side of the ocean) they likely fit together previously. This paper challenges that and other assumptions. Previous Small Earth Reconstruction Inconsistencies. There have been ~ 24 small earth re-constructions identified. Are they consistent in the placement of India, Australia, and Antarctica? Absolutely not. To make the point, the most famous 16 of the reconstructions will be highlighted in Table 1. Focus will be on the placements in the Pacific and Indian Oceans. The 16 are: Hilgenberg ´33, Brosske´62, Creer´65, Shields´79, Vogel´81, Kirilov ’82, Owens’83, Carey ~´88, Hurrell ’94, Adams´00, Luckert´01, Maxlow´01, Scalera´01, Myers´02, McCarthy´05 and myself, Wilson ’11. Began “Next To”, or “Away From” Africa? Table 1 indicates that 13 of 16 presented a position for India, with 50% tipping it in to Africa and 32% away. 3 made no decision. For Australia, all 16 were identifiable with 19% (3) near India, 32% into the Peruvian coast, 6% into Central America, 19% into the North Pacific or Alaska region, and 25% somewhere else. Antarctica was presented in 15 of 16. Its original position was believed by 25% to be by East Africa, 25% by Peru, 13% Central America, and 31% (5) someplace else. This indicates neither a consensus, nor reason for confident assurance of accuracy. Table 2 presents their specific location decisions. Modeling Using the Hoberman Expansion Globe. When earlier Expanding Earth (EE) researchers utilized expanding devices they typically used either one or two layer inflatable balloons. These are difficult to handle. A better device is a mechanical “Hoberman Expanding Sphere”, which in the chosen model expands from 6″ diameter to 12″ and back. 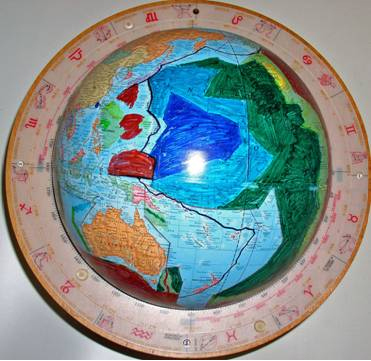 This allows for comparison to standard modern globes of 12″ (30 cm) diameter. Continental shapes can be traced from standard globes and then positioned on the Hoberman model. This was done for South America and Africa at ½ size (6″) and then expanded to 12″. Details can be found at http://eearthk.com/Articles02.html . What happened? The model presented an accurate illustration of these two continents fit and vertical movement without any Plate Tectonic Horizontal movements. It also illustrated that the experiment shows that expansion was – or could be – near symmetrical, rather than the more accepted Earth Expansion Theory assumption that expansion was asymmetrical. The experiment also works in reverse. 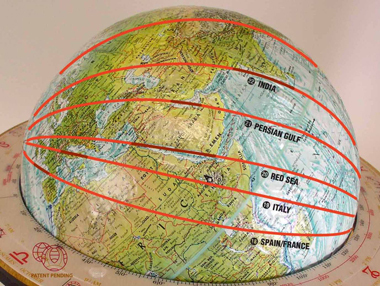 India, Australia, and Antarctica were accurately placed on the 12″ model and reduced down (symmetrically) to a 6” size (not shown). These results indicated that India tipped towards Africa. Antarctica stayed below South America and Africa, but then encroached on their coasts. Australia moved in towards Africa/India – but did not quite get there (Wilson ’11). This is a different result than all other full reconstructions. It does, however, correlate well to Carey’s findings. Ocean Age Data Transferred to a Globe. This standard data presented in flat map form needs to be transferred to a 12″ globe to remove visual distortions well known with flat map projections. Latitude & Longitude lines were added to the Isochron map to facilitate transfer as shown in http://eearthk.com/Articles08.html and here as Figure 1. Multiple new observations can be made from this globe data, especially after the Mercator projection distortions are removed. First, hidden in plain site, it is seen that there are large areas that are neither continent nor ocean. These are noted to be sediments. While some may be continental shelf and sediment run-off, others stand out due to their shape and huge surface areas. Once the data is transferred accurately to a globe it becomes easy to see that just east of Australia is an area larger than South America (Figure 2), and shaped nearly exactly the same. To the west of Australia is another “sediment” area about ½ the area of Australia. A third area attached to Antarctica in the Indian Ocean is greater than ½ the area of Australia. These areas need be considered in future small earth reconstructions and not totally erased away. That above link to Article 08 also shows the true moon orbit which is rarely taught and little known. The moon does not revolve around the earth, as is commonly believed. Orbit yes, revolve no. It has an entirely unique pathway in the solar system. Figure 3 shows the actual moon orbit – snakelike weaving in and out, but not revolving around. This orbit has significance here because it indicates the Earth most likely was impacted by a Mars size object in the distant past. Figure 4 shows the dark blue oldest (180 my) age ocean segment in the North Pacific. Figure 5 shows the exact antipode of that dark blue segment. Notice its alignment on the Mid-Atlantic Ridge. Just a coincidence that its arrow-like shape matches the shapes of near by South America and Africa where they connected? Impact, Antipode, and Equatorial Expansion. Astronomy’s primary theory of the moon’s composition and unique orbit is that a Mar’s size object struck the earth about 4 Billion years ago and that massive amounts of Earth’s crust and mantle were thrown into space and reformed as the moon. If this were the case, the above Article 08 indicates (and shows) there should be an impact site, an antipode reaction to the immense force, and a significant disruption at theequator to impact, that is still visible. It is shown that the impact would most likely be the dark blue area in the Pacific, the Antipode was then between South America and Africa, and the Equatorial evidence is the crack that became the East-Pacific Rise stretching from N. America almost to Australia. The sequence of events is recreated as: 1.The earth was solidified and formed at a smaller diameter. 2. 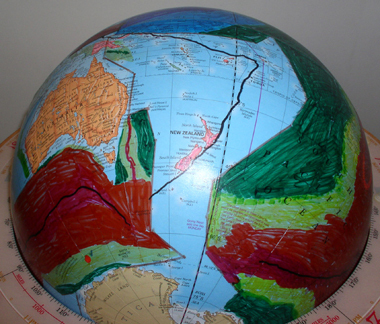 At an early age (4 to 2 BYA) the earth was impacted and the shock forces left significant cracks at the antipode and impact equator positions. 3. At about 180 MYA, the significant “fast expansion” (aka Carey , Maxlow, et al. ), began and the crust weakness at the cracks began to open and then propagated into the ocean ridge structures around the world. Expansion was perhaps more symmetrical than generally assumed. Fig. 4 Dark Blue – Impact? The above data can next be added to by showing 1) Continents have changed shape, and 2) these shape changes can be clearly correlated to Cosmology, Astronomy and Electro-magnetic energies. 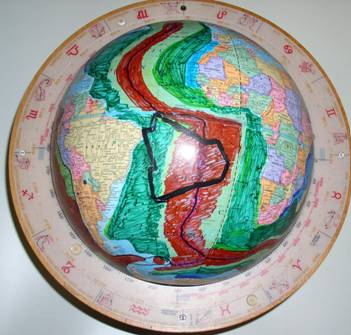 In 2007, evidence was presented that Great Circles drawn down numerous continental edges (lineaments) connected in 4 distinct surface points. Surprisingly, the points were themselves Antipodal and together formed a near perfect Great Circle. How Odd. Explanation can be found at http://eearthk.com/Expand.htm. From that site, two graphics are here highlighted. 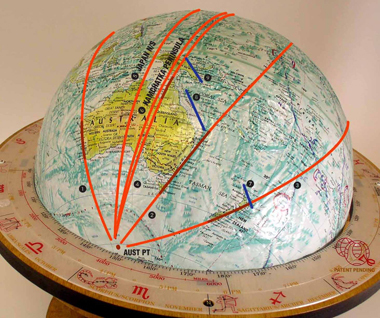 Figure 6 shows the Red Great Circles that initially defined the “Australian Pt” and thus its antipode the “Greenland Pt” (not seen). Figure 7 shows additional Great Circles GC’s between the Australia and Greenland Pts, in the European region. While not “proof”, it should surprise many that these GC’s lines define the primary structure of western India, the Persian Gulf, The Red Sea, the length of Italy and the continental shelf of Spain’s Bay of Biscay (among numerous others). Fig. 7 GC’s from Australia to Greenland Pts? In reconstructing a different smaller earth the dark blue area in the Pacific would not necessarily be refilled as it may have been ablated away. It could be treated as a removed continental shape. All or a significant portion of the 3 “sediment” areas mentioned would also be considered as missing Continental pieces. Recreations may then not be in the 50-55% smaller earth size but perhaps more around 70-80%. The mid-ocean ridges may be considered to be initial cracks caused by an early impact which then propagated with expansion. The obtuse angular shapes of many continents should be re-straightened to more closely agree to the ocean ridge shapes, as should be clearly done at Peru by accurately removing the yellow/orange age data area. Carey, S. W. (numerous papers by various authors), 1981, The Expanding Earth, A Symposium, Earth Resources Foundation, University of Sydney. 423 pp. Carey, S.W., 1988: Theories of the Earth and Universe – A History of Dogma in the Earth Sciences. Stanford University Press, Stanford, Ca, 413 pp. Maxlow, J. 2001, Quantification of an Achaean to Recent Earth Expansion Process Using Global Geological and Geophysical Data Sets. Curtin University of Technology. PhD Thesis. Maxlow, J., 2005 Terra non Firma Earth – Plate Tectonics is a Myth. Terrella Press, Perth, Western Australia. 156 pp. 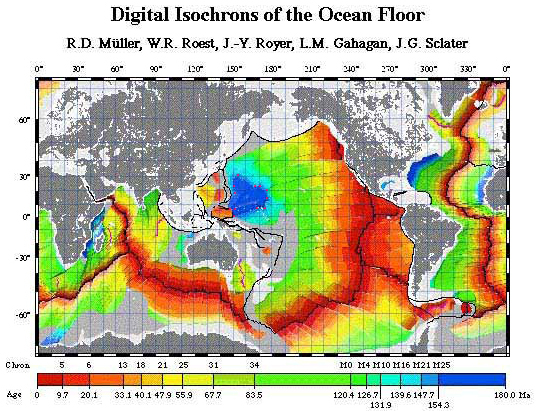 Muller, R.A., Roest, W.R., Royer, J-Y, Gahaghan, L.M., 1997, Digital Isocrons of the Ocean Floor. Scalera, G., and Jacob, K-H. (numerous papers by various authors), 2003, Why expanding Earth? INGV Publisher, Roma, Italy. 465 pp. Adams, N., Continuity Studios, www.continuitystudios.net/nmu.html, Clip 0, Clip 12.